On a sun-drenched southern tip of Mykonos, Scorpios encompasses a Beach, a whitewashed stone House, custom-built stages for daily sunset rituals, and ample open-air terraces spilling onto the Cycladic coastline. At one of the very rare beach locations on Mykonos offering uninterrupted views across the open sea, horizons of blue mix with yellows, golds, and pinks born of the generous Cycladic sun. Be it a chilled gathering of friends or a day of contemplative, creative solitude, our beach is a sublime retreat. 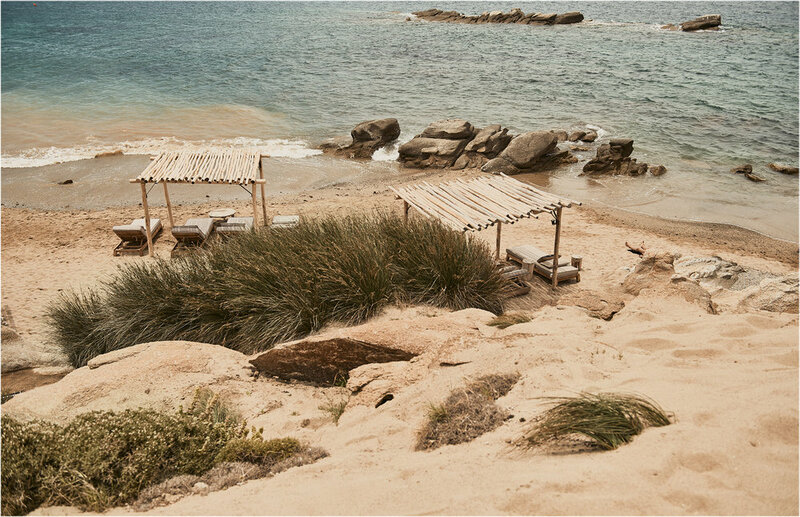 A few dozen wooden cabanas and sunbeds, elegant in their simplicity, blend discreetly with their natural surroundings. 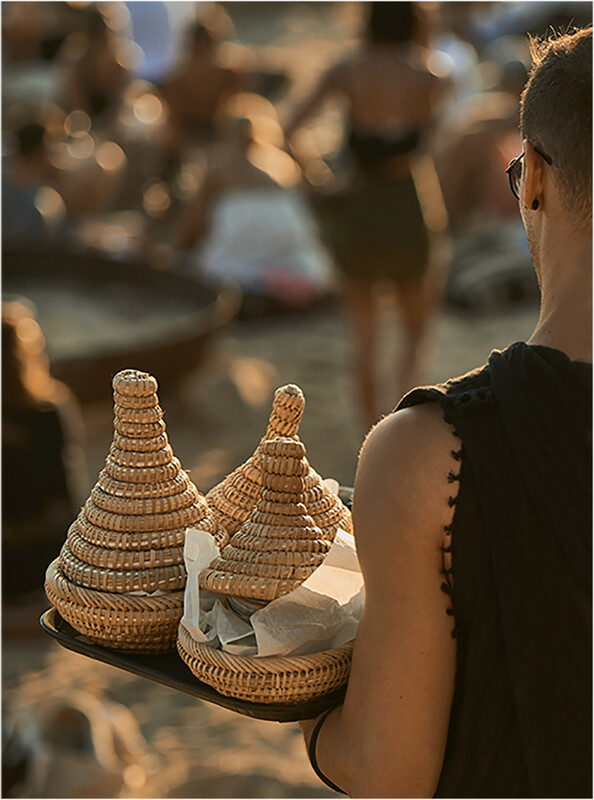 Privacy reigns supreme until the Sunset Rituals begin around 18:30 each day, igniting the nocturnal energies of Scorpios Beach. Prices include daily rent for a cabana (double sun bed and two single sunbeds) starting from 11:00am. Reservations must be confirmed by Scorpios team. Set high above the beach affording stunning views over Paraga and Kavos lagoons and beyond into the vastness of the Aegean Sea, the Terrace is both the prime seclusion and meet-and-mingle social spot at Scorpios. Here, intimacy is woven into the environment. Repose, in the sun or in the shade, have a glass of chilled wine, read a good book, dream, contemplate, slide into soulful melodies and a soft groove, breathe the breeze, enjoy passing time, float from the world... Reconnect to catch the sunset. A masterpiece of synthesis and expression, the whitewashed stone House has been opened on all sides, allowing air, people, and energies of all sorts to flow in and out freely. Its design nods to the ancient Greek concept of agora—a gathering place meant to galvanize the artistic, spiritual, and political life of the community. Like everything else at Scorpios, its form and function arose from collaborative effort, in this case by architects Dimitris and Konstantinos Karampatakis of Athens-based K-Studio and Berlin-based designers Michael Schickinger of Lambs and Lions and Annabell Kutucu. Mykonos is a maze game. Getting around the island is both puzzling and exciting – what makes it literally amazing. Planning your trip to Scorpios, Google Maps and other GPS tools are of great service. But even these are helpful only to an extent. Use them consulting your intuition. Heading South from the airport or downtown, make sure to first be checking with the road signs pointing to Paraga Beach as your general destination and then watching for indications to Scorpios. It may take you a few wrong turns, but you will find us! Sign up with your email address to receive our latest news, event updates, introductions and Makers & Artists, and Invitations for special events.